How to convert MIDI to FLAC with the best MIDI to FLAC Converter, MIDI to .FLAC Converter, MIDI2FLAC Converter? 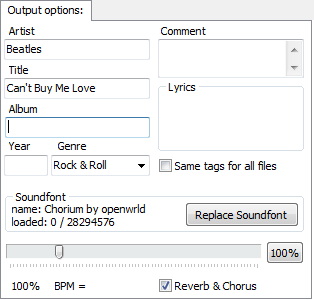 Online MIDI to FLAC Converter, install it and run. To start, double-click the MIDI to FLAC Converter shortcut on the Desktop. Or you can go to the Start menu and click MIDI to FLAC Converter. In this example we are converting midi files to flac format, so select .flac (MPEG-1 Audio Layer 3) in the Output format dropdown. To go back to the main program, click Close on the progress window and then it takes you back to the Magic MIDI to FLAC Converter.